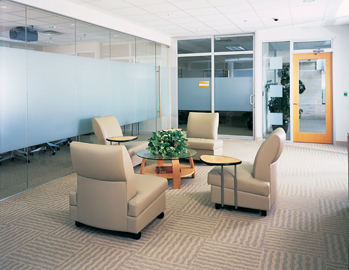 Elmore Associates offers you the advantage of professional attention, experience, service and quality materials. We provide on-site consultation and analysis, as well as the right solutions for each unique situation and expert installation. 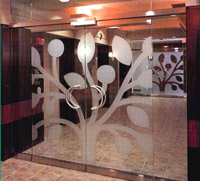  Enhance your business image with the quality look of etched or sandblasted glass...for doors, window, partitions and glass.  Ideal for company names, logos or simply decoration.  A great means for providing safety and privacy, e.g. in offices, conference rooms or entry ways. 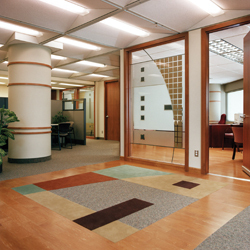  The material is available in a wide range of stock or custom cut colors and patterns. It is installed on site, and can be used for interior and exterior applications. A variety of patterns enhance style while providing privacy. 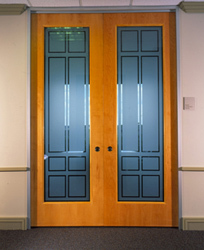 Patters and decorative elements can be added to any glass surface, including doors and custom shaped windows. The combined use of opaque and translucent films can create interesting visual effects. An additional sampling of our work. Window film can be applied to any glass configuration, providing protection for draperies & curtains, as well as carpeting & furniture. Elmore Associates © 2009 - 2011.